To achieve a 3R society (sustainable society, Circulation society). We help the people to hold responsibility for corporate survival. 3R (Reduce, Reuse, Recycle) has become an essential concept that every company has to consider to be able to struggle for corporate survival. However, to be able to “acknowledge the current situation of waste” and “to understand the specific reduction methods”, people will need an exclusive knowledge. Many companies are putting efforts in recycling activities. But are those activities effective enough? There are not yet many companies that have concerns in environmental costs and what kind of final impact they would give to the environment. Sometimes recycling can give a negative effect if not performed properly. There are some cases when unnecessary products are being produced because of recycling. Satisfactory International will offer the clients an environmentally and cost efficient optimal proposal that help the corporate reduce the negative impact on environment. Food recycling law is set to achieve a recycling society. 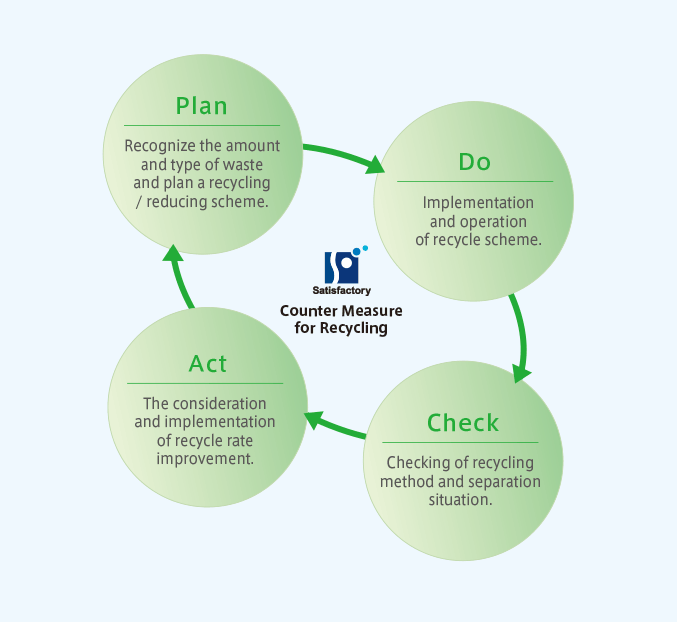 It is intended that all food-related operators continue to improve the implementation rate of recycling such as food waste, also in December 2007, the amended food recycle law has been enforced and the supervision has been strengthened. Satisfactory International will analyze the client’s current activities related to food recycling law and figure out the reference value and advice the best reducing plan possible.